Help date an Amber Wine Bottle - 27cm x 8cm - possibly pre-prohibition. 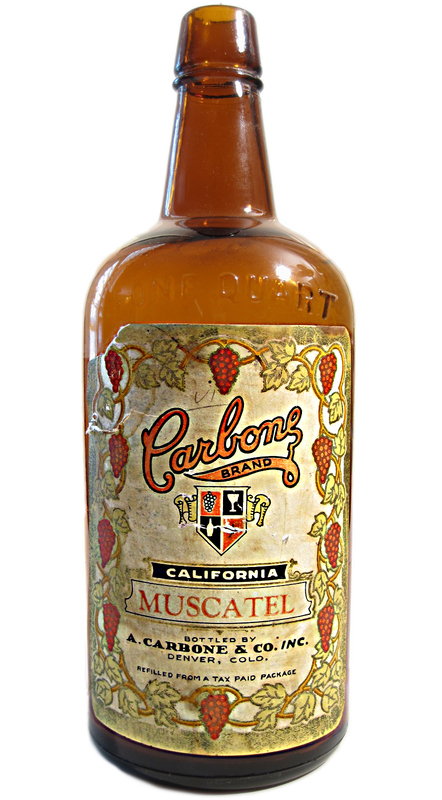 Our family was in the Liquor/Wine business, from after prohibition through the 50s. We have a small collection; the latest acquisition is different than the rest, we think it might be pre-prohibition from when our grandfather was bottling wine, possibly in Wyoming although the label says, Colorado. The amber bottle is 27cm x 8cm. The two-part (two side seams run up to the lip) bottle is fairly plain except "One Quart" is embossed in the glass just under the top curvature and there's a "2" embossed on the bottom. The paper label says, "Refilled From a Tax Paid Package". I might suggest looking through city directories for Denver to see if you can dig up any listings for this business. If the mold seam goes all the way to the top edge of the lip, then it is machine made and suggests a date after about 1920. If the mold seam stops at the ring at the base of the lip treatment, then the bottle is likely from the first or second decade of the 20th c.
There seems to be better data on hard liquor businesses (eg. pre-pro.com) than beer and wine. Note that this business was just a bottler, not a manufacturer so it could have been a small operation.